Congratulations to Jane Valencia on winning our 125th High Five Giveaway! Thanks to all who entered. 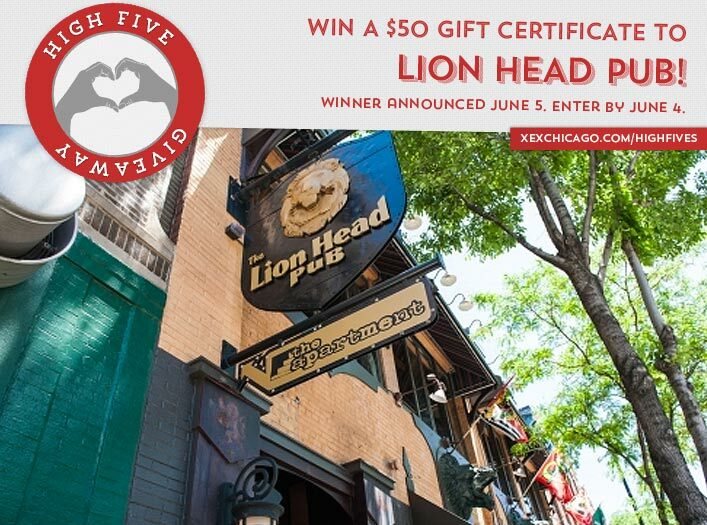 Our next giveaway is for a $50 gift certificate to Lion Head Pub! The Lion Head Pub takes the comfortable atmosphere of a classic, old-world pub and brings it into the 21st century with top-notch pub cuisine, pool, darts and televised sports. Voted “Best College Bar 2005” by Citysearch.com, this bar is a great place to catch a college or pro game with the three-foot-high table tappers, assorted wings and burgers. Overindulge in Lion Head Pub’s large collection of drafts, microbrews, domestics and imports. Lion Head Pub is located at 2251 N Lincoln Avenue, Chicago. Visit their website or call them at 773-348-5100 for more information. XEX’s Keara and Taylor taught what kind of class to the rest of our team on Tuesday, May 26? Now, just add a comment to this post with the right answer to be eligible to win! The winner will be announced on Friday, June 5. Entries must be received by midnight on Thursday, June 4. Good luck! They taught a make-up class!!!!! Looks like they were sharing the beauty with some makeup classes.